Mockup #2: The same as the project details mockup shown here, but in the mode where the project has been finished and the proposal that ended up getting used is highlighted. 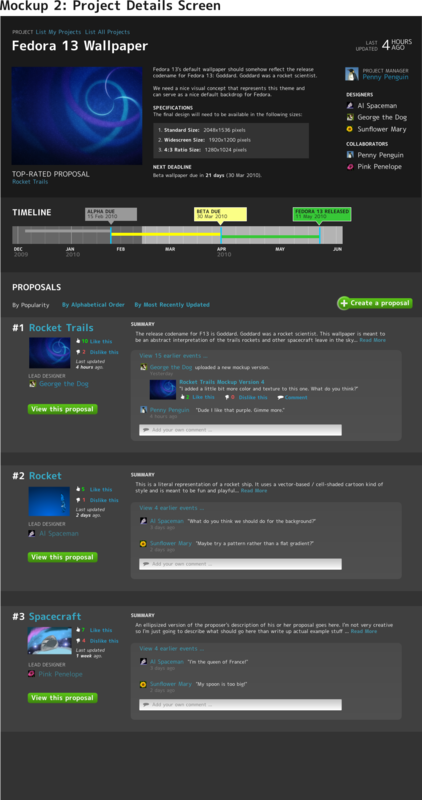 Mockup #3: A listing of all the projects going on right now. Maybe link to an archive of old ones. 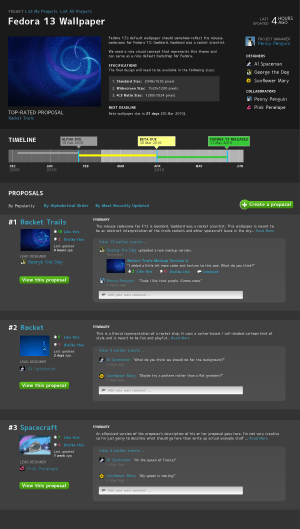 Each project should have a little preview of the activity going on ‘new proposal posted yesterday by jambalaya joe’ etc. Deadlines and status should be shown too. I know at least four of you (hi pcon, Arkanis, Yannik, and Colin Z.! 🙂 ) besides the folks at Isotope11 have expressed interest in helping out on the implementation of this project. I believe there is or will be a public git repo for it – the project is open source but we haven't really talked too much about sharing the code yet, I'll keep you posted. I make 2048×1536 (“standard”) 4:3 and 1280×1024 5:4. The timeline is a great idea, but you could simplify by drawing the ranges o one level, not as stair. The white outline is subtle for the bright yellow tag, but distracting with the green. I’d try no outline or a black one. The Like/Dislike is likely to lead to quick reflexive and highly subjective responses. Maybe other terms could encourage more thought, keeping the specific goals and requirements of a project in mind? For example adequate/inadequate. Also worth a though: require a comment giving reasons before a user can vote. The thing is that I would like to have a projectplaner, a wiki, a Lightbox (with very small editing tools in it) and a announcement and/or mailsystem in the whole Collab-System. So, the tool should be doing some more as “only” show us a new mockup, make annotations and so on. I think you’re on to something here, Máirín. You know how the aesthetics of one’s working environment can alter the very way people *think* about their work? Perhaps it’s time to let go of the crufty old mailman mailing lists and all their UNIXy arrogance towards the realities of the modern world?